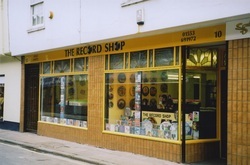 I remember stumbling across The Record Shop back in 1997, not long after it first opened. I wasn’t a record collector at the time but wanted to obtain a track that had eluded me for years. It was one of those songs that feature in the background of a movie that you can’t get out of your head, but not knowing the title or artist it was very hard to find (remember the Internet wasn’t about then). I gave Tony the proprietor some of the lyrics and he very quickly produced no less than 3 versions by different artists. After a listen and a chat about sixties music I left the shop with my first bag of vinyl 7” singles and that was it, I was hooked. I returned week after week, slowly amassing a collection of the popular hits of the sixties, before moving onto more obscure rarities as my tastes changed. Tony’s knowledge and stock in the shop is immense, if there’s a song you’re after the chances are he’ll know it and more than likely have it either on vinyl or CD. It’s always good to go in for a chat and there’s always music playing in the shop so it’s hard to leave without hearing a new tune. So if you’re heading to King’s Lynn be sure to drop into The Record Shop, but allow plenty of time as you won’t want to leave quickly! If you’re like me and become a regular (of which there are many) you’ll not only gain a wealth of knowledge on everything vinyl but you might just make a new friend! Matt Courtman. The Record Shop in St James Street, King's Lynn has got to be one of the best vinyl/secondhand CD & DVD shop in the country. The stock-holding is massive. I would recommend a visit by any serious collector. Tony, the owner, is extremely knowledgeable and helpful. (Aug 10, 2014) Stuart Thorpe said:Well worth visting and the owner Tony is very friendly.